We wrap up our coverage of today's pro-Morsi and pro-Sharia law demonstrations, as the upwards of one hundred thousand supporters, still gathered at Cairo University in Giza, begin to withdraw. Saturday's rally, which followed a week of opposition protests and an on-going Tahrir Square sit-in in response to President Mohamed Morsi's controversial constitutional decree, saw Muslim Brotherhood supporters and their Islamist allies from across the country converge by bus and on foot to the demonstration's grounds in Giza. Dubbed the 'Day of Legitimacy and Sharia,' today's demonstration gave Islamists in support of the constitutional declaration a chance to showcase their mobilisation potential as they seek to claim a popular and revolutionary legitimacy. They also sought to show that Morsi still has the backing of many Egyptians, challenging Tahrir protesters who had camped out in the iconic square since 23 November to demand the cancellation of the constitutional declaration. Both sides are showcasing their abilities to mobilise people as Egypt plunges into political deadlock, five months after Morsi assumed power in the country's first democratic presidential elections. “'It doesn't matter if there are millions in Tahrir, or if all the judges strike, or if the country is, as you claim it is, divided. In the end Egypt, the Egyptian people, will have the chance to make their decision about the constitution in the referendum - yes or no. After the referendum, Morsi will lose the powers from the decree and we can start parliamentary elections. With a parliament in place, if needed we can then debate articles of the constitution - it's possible to amend them after the constitution has been okayed by the nation. At least we'll have something in place. So really, I can't see why people are so opposed to Morsi's actions. It is clear that Morsi, who was democratically elected, remember, protected the Constituent Assembly as he didn't want to start the constitution-drafting process from scratch again - that would set Egypt back over eight months, which is mad. To me it seems like opposition for opposition's sake. Look - ElBaradei, Hamdeen Sabbahi - they are both Egyptians and we need a healthy opposition, I welcome them. But stirring up trouble for trouble's sake is not acceptable. We've got to get Egypt moving somewhere, otherwise all of us will suffer. Financially we're losing everyday. I believe this is the only way to restore calm to this country." 17:09 Spokesperson for the Egyptian Revolution Union, Khaled Said, spoke to Ahram Online about why he came today to support the president's decree. "I'm not here to demand the implementation of Sharia; this issue will lead to more division within Egyptian society and I believe it is not the right time to discuss such an issue," said Said. Said, however, pointed out that he supports Morsi's declaration because it fulfills the revolution’s demands. "We wanted to remove the prosecutor-general and to retry the killers of the martyrs," he says, adding that Morsi had to make his decisions, and the Constituent Assembly, immune from challenges by the judiciary "which, it is widely known, is full of remnants of the old regime." Said accused protesters in Tahrir Square of having special agendas and wanting Egypt to remain in chaos. "We say we want democracy; okay, then a referendum on the constitution will take place and people will get to vote yes or no - this is democracy," he says. 16:03 A tree fell on demonstrators in front of Cairo University, killing one person and injuring at least 15, a security source told Aswat Masreya news website. 15:55 Speaking now on the stage at Cairo University is the Salafist Nour Party’s Abdel-Moneim El-Shahat; he claims that Egypt's revolution only saw three million-man marches. "On 11 February [the day Mubarak left power], on 29 July [referring to the Islamist protest known as Kandahar], and on 1 December," said El-Shahat, who failed to win a seat in last year's parliamentary elections in Alexandria. 15:45 Meanwhile, at Dokki metro station in Cairo, dozens of passengers carrying Saudi Arabian and Egyptian flags left the station chanting "Islam is the solution" as they headed to the rally at Cairo University. 15:44 In Assiut city in Upper Egypt, dozens demonstrate in support of Mohamed Morsi and his constitutional declaration. Mass demonstrations are planned in Assiut after evening prayers, to take place in front of Omar Makram Mosque. 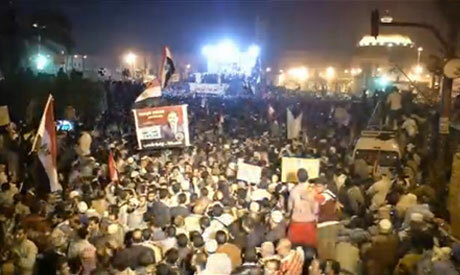 Participants from seven of Upper Egypt’s governorates are to take part in the Assiut evening demonstrations. On Friday, opposition demonstrations took place in several of Upper Egypt’s governorates, including Assiut and Minya, protesting constitutional declarations issued by the president. 15:42 Chants against the protesters in Tahrir Square can be heard at the pro-Morsi rally in Giza where numbers continue to increase. "I hear the mother of a martyr saying that Tahrir is now filled with 'felool' [remnants of the former regime]," chant the crowds. 15:38 An anti-Morsi protest was attacked with stones near Al-Qaed Ibrahim mosque in the coastal city of Alexandria, reported state-owned news agency MENA. MENA reported that several supporters of the president’s declaration were also present at the mosque; however, Muslim Brotherhood spokesperson Anas El-Qadi denied that any members of the Islamist group were demonstrating at the mosque. Buses can be seen parked next to the walls of the neighbouring Cairo Zoo. The road parallel to the zoo is totally filled by crowds, while demonstrators can also be seen on Gamaa Bridge. Around the Nahdet Misr statue, located opposite the university, huge numbers of demonstrators are gathered, holding pictures of the president and Egyptian flags. “We are here to support Morsi...the martyrs will be pleased if we stop killing and apply God’s laws,” says Fazwy Saleh, who identifies himself as a member of the Revolution’s Injured Movement. 15:36 Ahram Online’s Sarah El-Rashidi describes the atmosphere among pro-Morsi demonstrators in front of Cairo University as festive. 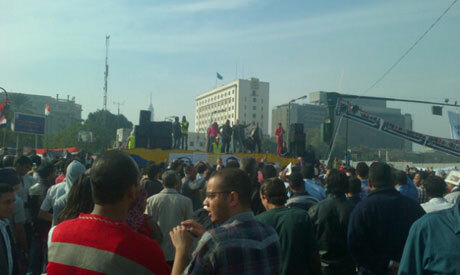 Songs are playing in support of President Morsi and the Brotherhood, as demonstrators are smiling and chanting. 15:23 For a visual narrative of today's pro-Morsi and pro-Sharia law rally or 'Islamic pilgrimage' as one demonstrator put it, have a look at our photo gallery. 15:15 According to Al-Ahram’s Arabic news website, minor scuffles have taken place between supporters of the president and his opponents in the canal city of Suez. Protesters threw stones at each other in Martyrs Square, until a number of residents managed to separate the groups. 15:04 For a more information on the Press Syndicate's decision follow this link. 14:26 The Egyptian Press Syndicate has announced, after holding a board meeting, that it rejects the draft constitution passed by the Constituent Assembly on Friday, saying that the charter infringes on the rights and freedoms of Egyptians, as well as freedom of the press. The board also announced that they will be taking disciplinary measures against those syndicate members who have been members of the constitution-drafting body as journalist representatives, despite the board’s earlier decision to withdraw from the assembly. The disciplinary measures will apply to syndicate Chairman Mamdouh El-Waly, who refused to withdraw from the Constituent Assembly. The syndicate further declared its support of those newspapers that will be holding a one-day strike on Tuesday, as well as the television channels that will not be broadcasting on Wednesday, in protest at the newly-issued constitutional declaration. Syndicate members will also hold a march from the press syndicate headquarters in downtown Cairo to Tahrir Square on Tuesday, starting at 1pm. 13:51 A speaker on Tahrir Square’s central stage tells the crowd: “Morsi’s loyalty is not to Egypt but to the [Muslim Brotherhood] Supreme Guide,” reports Ahram Online reporter Bel Trew. 13:55 Ahram Online reporter Ekram Ibrahim says that several protesters in the pro-Morsi march have refused to give interviews to her, or have expressed nervousness while talking to her. She did, however, manage to speak with 65-year-old Muslim Brotherhood member Heba Mohamed, who says that what brought her to the protest today "is Islam." "Those in Tahrir are against Islam. They want the worst for Islam," says Mohamed. 13:46 Commenting on the current situation in Egypt, former parliamentarian Mostafa Al-Naggar urges the president via Twitter to resolve the current division between political forces in Egypt. "I ask the president to not put the constitution to a referendum before a national consensus is reached and for all controversial articles to be amended," added Al-Naggar. 13:40 As thousands chanted "from East to West, Egypt will remain a Muslim state whether secularists like it or not" at Cairo University, Ali Hafez, a member of the Return to Sharia Movement, tells Ahram Online that he sees today's protest as "an Islamic pilgrimage." "This is a real million-man demonstration, not like the one in Tahrir Square; people in Tahrir have a problem with beards. We are the real revolutionaries," added Hafez. 13:30 Protesters in several lower Egyptian governorates are currently preparing to head to Cairo to join the 'Legitimacy and Sharia' million man demonstration. 13:17 Meanwhile, Al-Ahram's Arabic news website reports that the president's meeting with members of the constituent assembly has been postponed to 7pm this evening. Members of the assembly, headed by Judge Hossam El-Gheriany, plan to present Morsi with a copy of the recently finalised constitution. 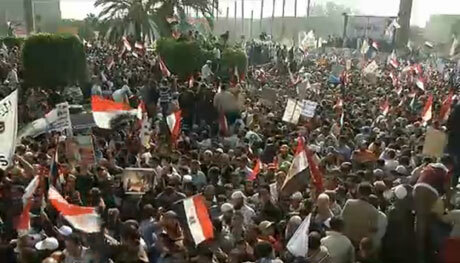 13:14 Thousands of pro-Morsi demonstrators are marching towards Cairo University. 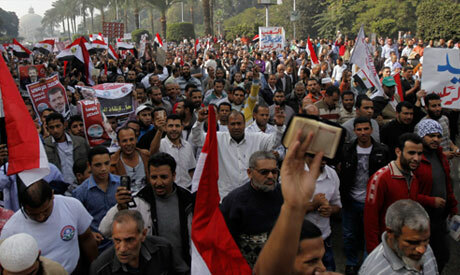 One march has kicked off from Mohandissen’s Mostafa Mahmoud Mosque and another from Old Cairo’s Amr Ibn El-Aas Mosque. 13:10 Friday witnessed mass opposition marches and protests in Tahrir Square. As tens of thousands demonstrate in Cairo’s Giza district to support President Mohamed Morsi’s decisions, the square is quiet and empty. A sit-in against the Brotherhood, its Islamist allies and Morsi's declaration is still ongoing. 13:07 Hundreds of protesters are on their way from Sinai to show their support for the president's declaration, according to an announcement made on a stage at Cairo University. 12:55 Safaa, a housewife with a diploma from Cairo University, tells Ahram Online reporter Sarah El-Rashidi that she is at the demonstration to support President Morsi. "He is a very clever man; he hasn't done anything wrong. He has offered provisions to the families of the martyrs and he did what he did with the constitution to push the country forward”, she says. 12:52 "No one here is smoking hash; no one here is being paid like those in Tahrir square," Mahmoud Saleh a 58-year-old member of the Muslim Brotherhood tells Ahram Online. "We are talking about an elected president, we should not come out now and call him a dictator. If he were a dictator he would not have let some TV anchors insult him," adds Saleh, who stressed that they would not all "Tahrir's minority to rule us." 12:50 Speaking to our reporter Sarah El-Rashidi, Hussein El-Aadi, security head in the Giza Governorate, states, "I am here (at Cairo University) to ensure security and stability and prevent clashes." When asked why security forces are absent during recent opposition protests in Tahrir Square, El-Aaadi replied, "The police are often attacked there, in Mohamed Mahmoud Street; they do not want to put themselves in a vulnerable situation." 12:40 Ahram Online reporter Ekram Ibrahim spoke to a member of the Salafist Calling from Alexandria, Attia Mahmoud, who tells her that he is here to call for the implementation of God's law. "Morsi's decisions are the enforcement of God's law, and God is our creator and he wants what's best for us," said Attia. Attia adds that Morsi's decisions will help stem remnants of Mubarak's regime and rein in thugs. "It's like a refrigerator that comes with its manual, when God created us our manual was the Quran and the Sunna [the prophet's teachings], and they are what we must follow," he adds. 12:37 The growing crowd gathered at Cairo University chant in support of Morsi, while waving Egyptian flags and black flags emblazoned with "No God but God" – a symbol employed by Al-Qaeda. One of the many banners declares, "Sharia, Sharia" (Islamic Law), while another reads: "Tahrir is not all Egyptians; it is just a drop in the sea." Notably, the majority of protesters are male, says our reporter on the ground. 11:30 According to Ikhwanonline 18 political groups will join Saturday’s million man demonstration. They include the Muslim Brotherhood, the Salafist Calling, the Revolution Guardians, the Egyptian Revolution Union, the Front to Protect the Revolution, the General Revolutionary Coalition, the 25 January Youth Coalition, the Free Islamic Coalition Movement, the People of the Sunna Scholars Movement, the Preacher’s Syndicate, the Freedom and Justice Party, the Salafist Nour Party and the moderate Islamist Wasat Party. 11:24 Good morning. We return to bring you coverage of today's pro-Morsi rally in Cairo, the latest in a series of demonstrations sparked by President Mohamed Morsi's controversial constitutional declaration, which granted his office unfettered authorities. Thousands have already gathered in support of the constitutional declaration in front of Cairo University, where a stage is currently being erected. “People want the president’s decision” chant the demonstrators. According to Ikhwanonline, the Muslim Brotherhood’s official website, three marches are planned for today. One will move from the Mostafa Mahmoud Mosque in Mohandiseen, another from Amr Ibn El-Aas in old Cairo and yet another from the Istiqama mosque in Giza. All will converge on Cairo University. After ten days of a sit-in in Tahrir Square and nation-wide protests against Morsi's contentious declaration, major Islamist parties and groups have responded by calling for a mass rally. Dubbed the day of 'Legitimacy and Sharia,' the participating Islamist groups called the demonstration in a bid to give the president popular and revolutionary legitimacy and show support for the draft constitution, which is widely expected to recieve Morsi's approval shortly although rejected by Egypt's disparate opposition forces and protested against by hundreds of thousands across the country in the past week. The rally had already been rescheduled twice to avoid clashes with opposition. Pro-Morsi groups had initially planned to hold the demonstrations Tuesday but postponed it because of opposition protests planned the same day. The groups also moved the venue of their rally from Tahrir to Giza, in an effort to avoid clashing with the thousands still occupying Cairo's flashpoint square. Among those expected to participate are the Muslim Brotherhood and their political wing the Freedom and Justice Party, the Salafist Nour Party, the moderate Islamist Wasat Party, the Al-Gamaa Al-Islamiya, the Salafist Asala Party as well as other Islamist parties and groups. Keep it up and do not give chance to Hypocrites.